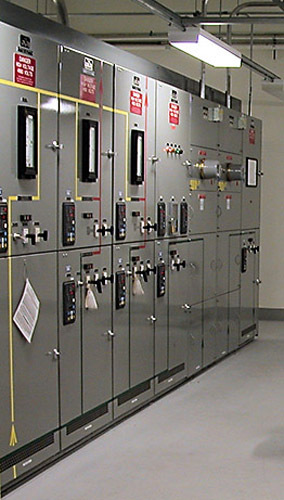 This is one of two metal-clad service switchgear operating at 4160V that provide enhanced redundant support to the local and long distance telephone loads at a telecommunications facility that was upgraded from a 480V system while keeping that system in operation. These switchboards feature double busses, both commercial and standby, which feed stacked automatic transfer circuit breakers that employ microprocessor-based overcurrent and directional overcurrent protective devices. We were part of the design team whose basic problem was that the existing standby 480V generators supplied more fault current than the existing 1960’s vintage 480V switchboards could support. The resulting design contributions saved the customer considerable amounts of time and money while providing a highly elevated level of redundancy to their existing, installed, systems. We employed our “Look Ahead” PLC programming algorithms to operate the thirty existing low voltage automatic transfer breaker pairs in concert with the four medium voltage automatic transfer breaker pairs. This system employs PC-based networked monitoring located at the Master Control Console and in the Power Support technical offices located throughout the building. This monitoring provides event logging, load trending, and system monitoring including animated bus diagrams of the individual medium and low voltage switchboards to enhance troubleshooting. This system has been recently updated with additional loads installed in the existing switchboards along with their associated controls and monitoring.